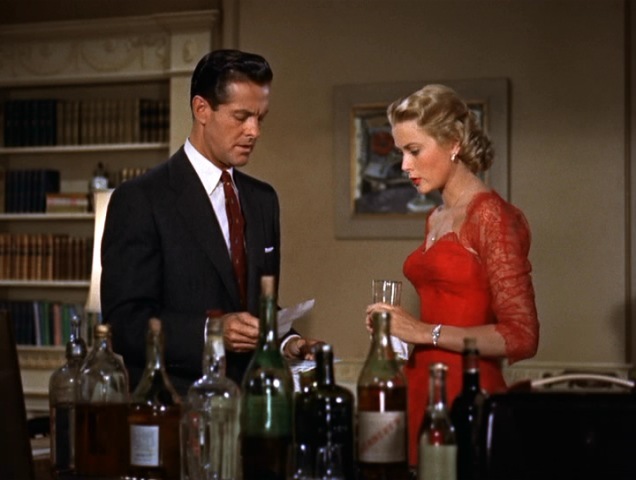 This is the third installment of a five-post series about Dial M for Murder. For over half a century, filmmakers had been embellishing their technology, adding sound, color and improved film stock with one aim in mind: to make filmgoers forget that they were watching a movie. Then along came 3D. Promising an added dimension of reality (Julian Gunzberg's “Natural Vision” process rose to become the preferred technique), those 3D techniques accomplished just the opposite, actually reminding viewers that it's only a movie. Much of the problem lay with its vaunted depth illusion. An article in New Screen Techniques proclaimed in 1953 that “action now can seem, not only to recede into the distance beyond the opening, but to come forward through the opening.” As if that were a good thing. By seeming to protrude into the audience, 3D broke the fourth wall, interrupting viewers' suspension of disbelief. It didn't help that those cardboard spectacles were distractingly itchy and finicky and induced headaches. As a result, it was nearly impossible to become fully engrossed in a 3D movie. 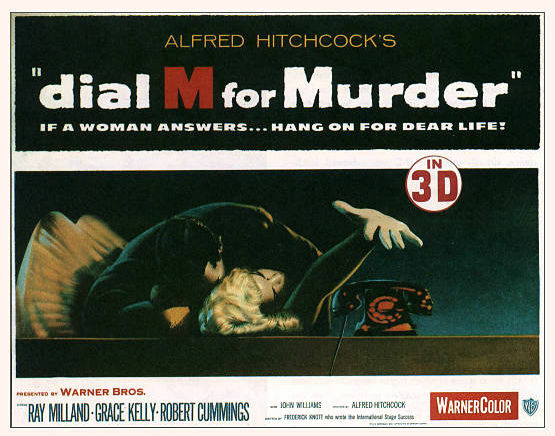 Those were the challenges facing Hitchcock when he went into the studio to shoot Dial M for Murder in 1954. Long accustomed to turning a sow's ear into a silk purse (look at the performances he was able to extract from actors with whom he only reluctantly worked), Hitch integrated 3D's limitations into the concept of the film itself. Dial M is a story about a perfect murder that relies on perfect timing and clockwork execution for its success. It's a story about process, where the mechanics of the plot draw attention to themselves. 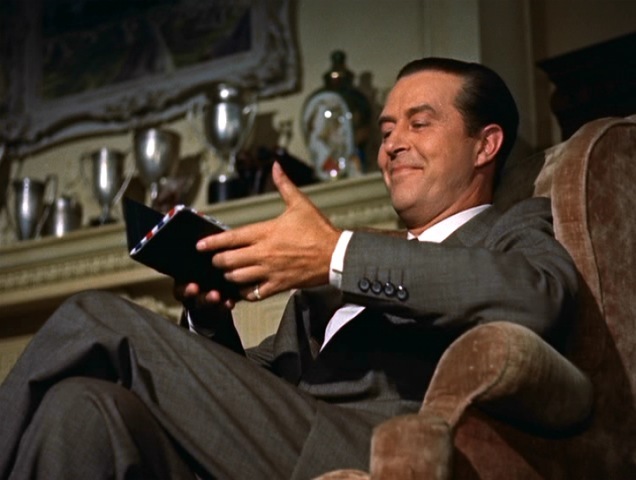 As we are made privy to the details of Tony Wendice's plan (as performed by Ray Milland) , the big questions are, How will he do it? And, Will the plan work? The machinery of 3D was the perfect foil for the mathematics of the plot; the intersection of those two concepts -- plot and production design -- occurring with the close-up of Tony's finger in the telephone dial, followed by a view of the telephone relays sliding into place with the lethal snick of a firing piston. Tony himself isn't as smart as he is methodical, modestly admitting, “I've had time to think things out.” Charming though he is, we never fully warm up to him. He's cool and distant. Then again, none of the characters has much fire. That once-torrid affair between Margot and Mark Halliday (Robert Cummings) has gone cold and, as Eric Rohmer and Claude Chabrol put it, “the lover is a complete caricature, and the wife is as dumb as she is pretty.” Chief Inspector Hubbard (John Williams) is doubly reserved behind his British manners and his badge. No one in this story really connects. Not to sell them short – each character is fascinating and the acting is splendid, but that's the point: these people are as captivating as a new, exotic species of dragonfly under a magnifying glass. It's the plot and the deft storytelling that make this film a perennial favorite. That distance is emphasized by Hitchcock's composition in stereoscopic relief. 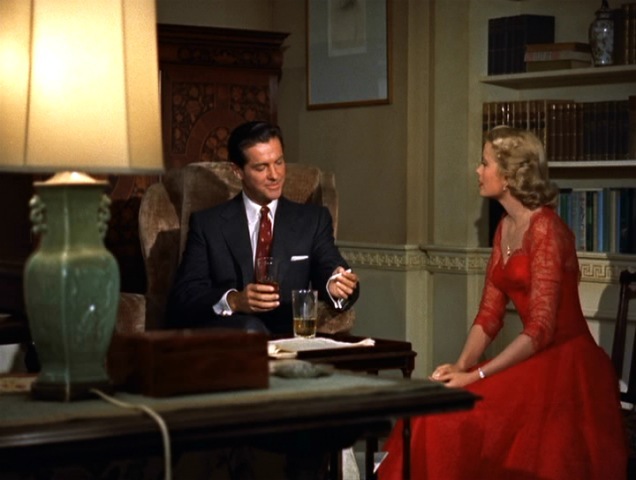 Repeatedly, lamps, tables, chairs and even a bed are placed between the characters or between the audience and the action. As Sheldon Hall Noted in Film History magazine, this composition “calls attention to the space around and between the actors, and between the actors and the camera,”subtly reinforcing their isolation. Paradoxically, while 3D brings us closer to the action, it distances us as well. Hitchcock knew that going in to the project, and, for a man who built a reputation bringing audiences into the subjective experience of his movies, he played to those opposing tendencies of 3D. Dial M keeps us at arms' length, as privileged observers, rooted in the mechanics of the plot as we are rooted to the mechanics of the film itself, mediated by those never-quite-satisfactory polarized spectacles. Anticipating the audience's desire to experience three dimensions, the opening scenes include this crowd-pleaser of the looming ship that is neatly foregrounded by the picket fence and two dockhands. Fences and fence-like objects appear throughout the movie, pointing up a division of space, foreground to background. 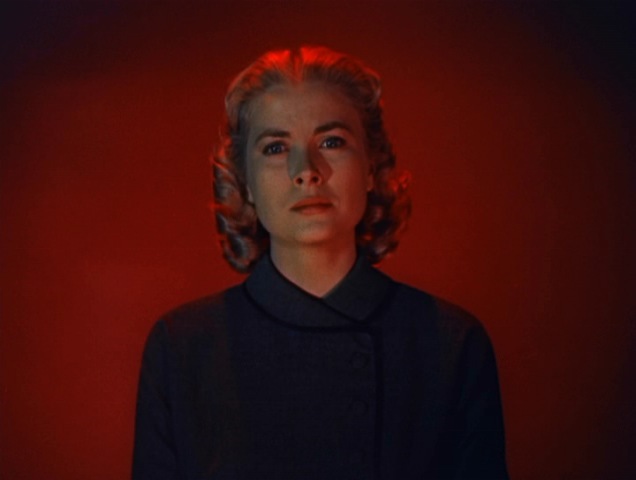 It also signals Hitchcock's aesthetic concept that he would use 3D, not to create false intimacy through gimmicks, but, rather, division and compartmentalization. 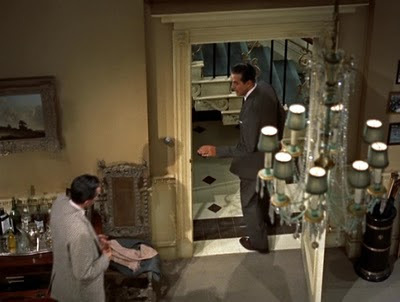 By carefully placing objects prominently inside the frame, Hitch created a sort of ad hoc proscenium, smaller in scale than the pillars flanking a theater stage and thus more porous, conjuring up an illusion of distance and space that conveys a sense of exclusion and detachment. One of Hitchcock's cardinal rules was that the camera should never seem to break any physical laws. In this shot, however, the wall behind the liquor cabinet seems to have been rolled away. It is as if the camera, as invisible man, has been granted uncanny powers – as testified by subsequent scenes. The tension in this shot derives from its almost supernatural perspective that suggests proximity, yet which is nevertheless fenced off by the row of bottles. In this “God's eye view” shot (another “impossible” view), Tony rehearses Lesgate through the steps he should take to commit the murder. The lamps and foregrounded chandelier enhance the binocular effect, again making one feel present in the room, yet detached. The angle is repeated later as the police survey the scene of the crime, attempting to retrace the Lesgate's steps. For these extreme low-angle views, Hitch ordered that the set be elevated and a hole cut in the floor up through which the camera would peer. Hitch's aim was to magnify the "impression of [3D] relief." Isolated, bewildered, terrified and doomed, Margot, seemingly floating in space, crumbles under cross-examination, the alternating red and gloomy grey lighting mimicking the colors of her wardrobe, which had also grown gradually somber. In 3D movies, the sensational lunge into the audience is almost always some sort of assault, as from a flying fist. 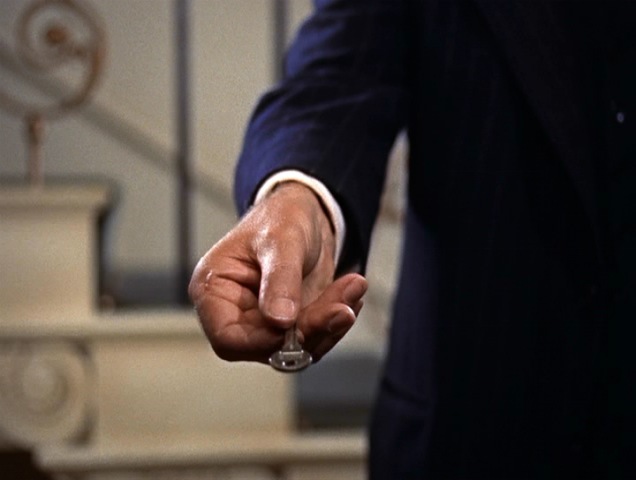 This scene may be the only case in which the device is used to draw out audience sympathy as Margot's hand grasps outward, as if seeking or help. Says film professor William Paul, “Even as Kelly's hand reaches out into our space, it also reiterates the unbridgeable gulf that separates our space from that of the film image because we know we cannot reach back. As we finally cannot participate in the action on the screen, our status as passive viewers is forcefully reinscribed at a moment that effectively makes us complicit in the attempted murder.” That complicity began early on as we aligned our allegiance first with Tony and then Lesgate. Only during the murder scene are we finally urged to root for poor Margot, and even then, under duress of guilt. Hey there! Send him on over. Would love to hear what he has to say! Personally, I've always liked DIAL "M" FOR MURDER precisely BECAUSE it keeps viewers at arm's length; I'm always thinking about what the characters are really trying to say beneath their masks. Also, I love the scene between Ray Milland and Anthony Dawson, and Milland's silky yet sinister way of reminding Dawson that he's already responsible for a woman's death: "Poor Miss Wallace." It'd be interesting to see how today's modern 3D F/X might change the audience response. Excellent article! Interesting question, there. I wonder how DIAL M would go over in 3D now that the technology seems to be here to stay. Perhaps audiences are ready to step up to the level of connoisseurship.